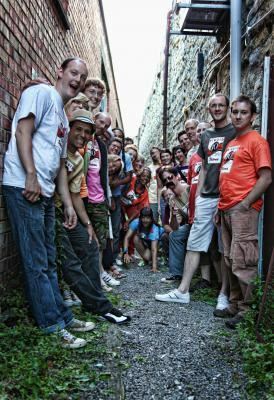 For the last three years, Ziriguidum has brought together percussionists from the West of England and South Wales to play the modern Brazilian carnival music developed by Rio De Janeiro group Monobloco. Ziriguidum's musical director, John Paul Courtney, has performed in the UK & Brazil with Monobloco, who have built a reputation as a popular live act and recording group as well as being one of the biggest attractions of the Rio carnaval. Ziriguidum's performances at festivals and shows around the UK have featured Monobloco singer Fabio Allman. Plans are underway for more live performances in 2011. The group also offer an annual percussion course for experienced musicians with workshops taking place in Bristol each month. The next course will start in September 2011.